In this activity, students count kernels on an ear of corn. The corn is the product of a dihybrid cross, so that the phenotype of the kernels will follow a 9:3:3:1 ratio. Corn can be purchased from biological supply companies or through Amazon. The activity does not require growing the corn, so it can be completed in one class period. 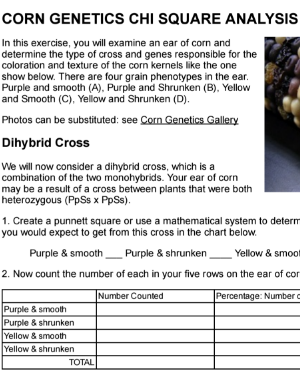 After students collect data on the kernels (yellow/purple, smooth/shrunken) they use a chi square analysis to determine if the number was close enough to support the hypothesis that the parents were heterozygous for both traits (PpSs xPpSs). Worksheet includes additional chi square problems for practice.